Welcome to the first and most popular blog about biology olympiads. We hope you will fin useful study resources and tips and tricks that will help you prepare for science olympiads and competitions. Many students at the beginning find it difficult to get started. Often they are unsure what to read or what to do to qualify for next rounds. Below find my step-by-step guide that will help you get started! Familiarize yourself with your contry’s biology olympiad guidelines. In the official website of your national biology olympiad you can find a document that outlines aims and objectives of the olympiad as well as topics covered. Moreover, there might be a syllabus which describes what topics you must know. If you cannot find anything, take a look at the International Biology Olympiad syllabus here. Get the books that you are going to read. And not only get them, but actually start reading them as soon as you can. The more you read, the more knowledge you get. I also tend to read different books of the same topic because in that way I am able to consolidate information quicker. However, maybe for you the best way is to focus and read only the same book for that topic. To find my suggested reading list, go here. Use the tips and tricks suggested here to facilitate and accelerate learning process. Use notes, watch videos, listen to podcasts, and do not just sit and read. The more sensations you involve in learning process (vision, hearing, smelling, olfaction, and yes tasting), the better your hippocampus and motor cortex will work. As a guidance, read Tips&Tricks section. Here I uploaded amazing revision notes. What I suggest is to print them off and keep it to revise just before the contests. After you are equiped with basic knowledge, get and find past papers from previous biology olympiad or contest. Here I uploaded some of the past papers that I managed to gather, including USABO, IBO, BBO, NZIBO, INBO, South African and Autralian Biology olympiads, and Toronto Biology Contest. I also have compiled explanation sheets for both Open and Semifinal USABO past papers. They include a lot of facts and details, solutions to math problems, images and illustrations and they range from 30 to 70 pages. If you like to purchase them, get in touch. I also started creating IBO explanation sheets so also contact me for further details. DO NOT study alone. Join clubs, groups, forums where you can find other kids interested in biology. Talk and share about what you learned in classroom with your peers and teachers. The more you speak the information out load, the more likely it is that you retain it hopefully till the first round of the competition. Also ask for assistance from teachers to explain things that you do not understand. I also tutor students online via Skype so if you need help, read here about tutoring. Develop your practical skills. This section contains information and handouts that are useful for developing skills in the lab. Get in touch with your biology teacher to get access to school lab. Also email professors from universities and institutes around which would let you into the real lab to do some ‘groundbreaking’ experiments. Also check out the section here about ‘Summer placements’. 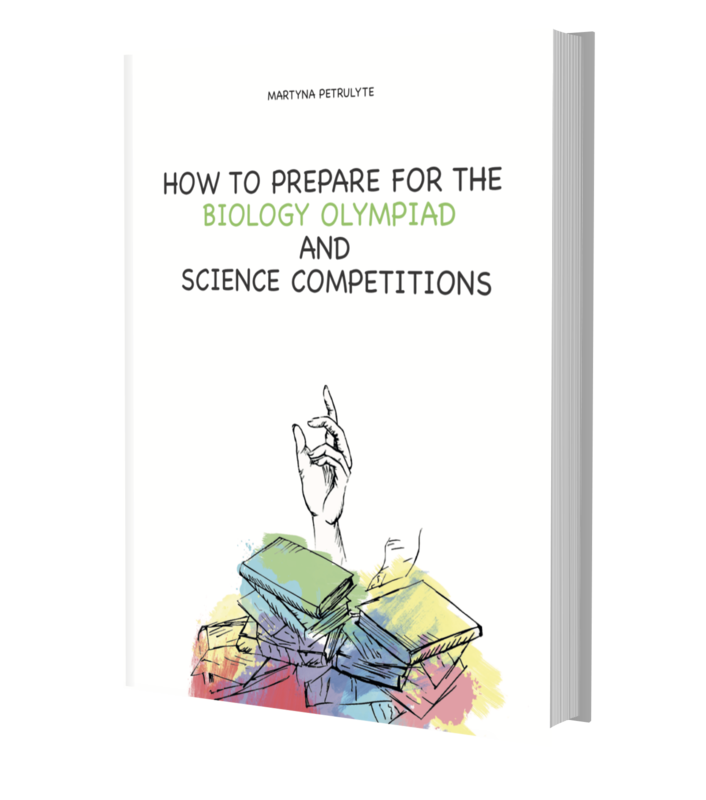 Get your copy of How To Prepare for the Biology Olympiad And Science Competitions by Martyna Petrulyte on Amazon. From test taking strategies to managing stress to dealing with failures – this book has it all you need to prepare for any biology olympiad.